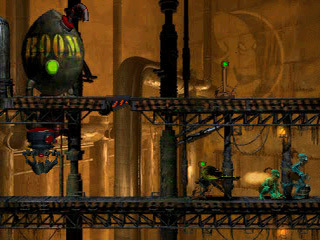 PSX Oddworld: Abe's Oddysee (USA) in 42:55.85 by Dooty. This is the condensed version of Dooty's earlier 100% run, in which only one (required) Mudokon is saved. This movie should be perfect for those who don't care about the well-being of the Mudokon race and just want to see some Oddworld parkour. Naturally, this run gets the bad ending. The movie is slightly shorter than it should be due to emulation-related speedups during screen transitions. The gameplay itself is at mostly the correct speed.